Symbiodinium microadriaticum is a species of zooxanthellae . Zooxanthellae is not a taxonomic name, but refers to a variety of species that form symbiotic relationships with other marine organisms, coral in particular. 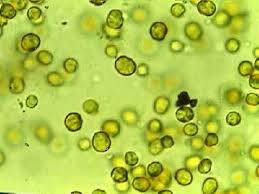 Zooxanthellae are spherical unicellular organisms. In their brief free-living form, they have a pair of flagella to move about in order to find a suitable host species. From a metabolic standpoint, zooxanthellae are mixotrophs. They are mainly photosynthetic but will also ingest other small organisms on occasion. Zooxanthellae are primarily known for their symbiotic relationships with coral. The zooxanthellae provide the coral with photosynthesized nutrients while the coral provides zooxanthellae with protection in the form of a calcium carbonate skeleton. Zooxanthellae will also inhabit clams, flatworms, mollusks, sponges, sea anemones and jellyfish. Symbiodinium microadriaticum are a marine species and are commonly found in shallow tropical waters where light can penetrate. They are highly prevalent in coral reef ecosystems. Coral bleaching occurs when the environmental conditions become unsuitable for zooxanthellae to live. They leave their coral hosts to try and find better living conditions. Since the coral depend on zooxanthellae for nutrients, they soon die, leaving bleached-looking skeletons behind. Coral bleaching is playing a large role in the destruction of the world's coral reef ecosystems. Humans depend heavily on the resources obtained from coral reefs. Without the zooxanthellae, the coral would not be able to survive. Ultimately, the coral reef ecosystem will become unbalanced and lose significant levels of biodiversity along with the resources that humans depend on.